What does all this fast-paced living get you? Recently a friend and I reflected on this culture that inspired the movie “Click” starring Adam Sandler. The film speaks to this growing trend to be in such a hurry (to get through experiences) that we miss savoring the moment we are in. At what cost? Are you missing all that much? Do you satiate each moment? Recently I have begun a more intensive yoga practice, admittedly struggling at times to find it worthwhile to pause my endless to-do list to take time for a suggested morning and evening meditation. I try to live meditatively, and yet I still find myself running around to find my cellphone or sunglasses: a tell tale sign of my lack of presence in action- and the hit it takes on my life. Being fully present in each moment takes work, a skill, like most, that requires practice. Consider a baby learning to walk. Think of how many fallen attempts precede even the first step, let alone mastery of the new skill. 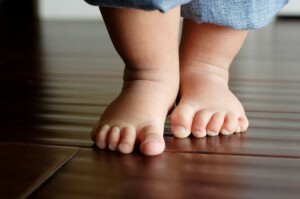 If you were willing to fall as many times as a baby learning to walk, what could you accomplish? Thomas Edison had the perspective that each unsuccessful attempt to invent the incandescent light bulb was not failing, rather, he was learning ways that did not work. As you learn ways that do (and don’t) work to succeed, will you have the patience to be present so you find ways to enjoy the journey of practice until you reach (or even surpass) you goal? When I started reading this article, I was in that “rushing for no reason” mindset. But your words were a great reminder to just slow down and really be in the moment. Thanks for sharing!